NORTH ANDOVER, Mass.--(BUSINESS WIRE)-- To meet growing demand and increase delivery speed to customers around the world, Watts Water Technologies, Inc. (NYSE: WTS) today announced the expansion of its BLÜCHER global design and stainless steel drainage system manufacturing capabilities in Europe and North America. In order to accomplish this expansion, Watts is adding 55,000 square feet to its production facilities and warehouse in Vildbjerg, Denmark, and creating new training and testing facilities for customers, business partners, and employees. The expansion is expected to be completed by May 2019. In addition, Watts announced it has begun to produce BLÜCHER stainless steel trench drains at its facility in Fort Worth, Texas. 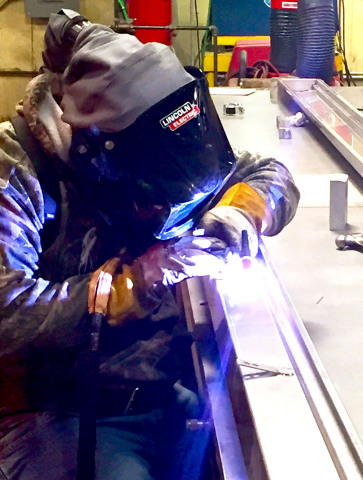 The Fort Worth facility specializes in the production of high precision stainless steel products for the water heating market under the PVI brand. "By combining the sanitary design and stainless steel drain manufacturing expertise of our Denmark team with the stainless steel manufacturing expertise of our PVI team, we can deliver BLÜCHER quality to all of our North American customers with increased speed, flexibility, and reliability," said Mark Hamilton, Vice President and General Manager of Drains – Americas. In both Vildbjerg and Fort Worth, Watts has invested in new manufacturing equipment, and the company has expanded its teams in growing markets globally to further support customers for its BLÜCHER products. "As leading food and beverage brands and their facility design partners continue to increase their focus on hygienic design and water conservation, we have seen a significant increase in specification of our BLÜCHER stainless steel complete process drainage systems,” said Munish Nanda, President, Americas & Europe. The full BLÜCHER product line, including custom orders, will continue to be available from our BLÜCHER manufacturing facility in Denmark during the expansion. The Watts BLÜCHER line of products consists of quality stainless steel drainage products and systems. BLÜCHER solutions include modular drainage channels, floor and shower drains, pipe and fittings, and custom solutions for residential, commercial, industrial, and maritime use. All BLÜCHER solutions have a modular design that supports fast, easy system installation. For more information, visit Blucher.com. Watts Water Technologies, Inc., through its family of companies, is a global manufacturer headquartered in the USA that provides one of the broadest plumbing, heating, and water quality product lines in the world. Watts Water companies and brands offer innovative plumbing, heating, and water quality solutions for residential, commercial, and industrial applications. The company employs 4,800 people in more than 50 offices across 24 countries. For more information, visit Watts.com.